Obama not only trained at ACORN, he worked with ACORN in the 1992 election, he was an ACORN lawyer and he was endorsed by ACORN. 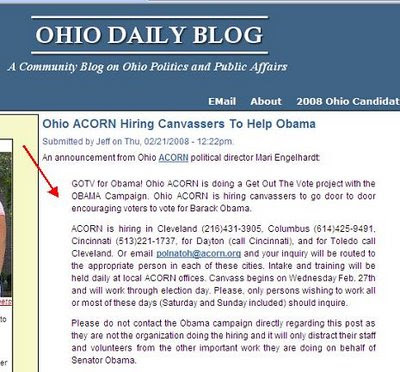 Ohio Daily Blog even posted the email announcing the ACORN-Obama ties. Now today we find out that the Obama Campaign was giving donor lists to ACORN. A former staffer for an affiliate of the Association of Community Organizations for Reform Now testified today that the organization was provided a “donor list” from the presidential campaign of Barack Obama in late 2007 for fundraising efforts. Anita Moncrief, a former Washington, D.C. staffer for Project Vote, which she described as a sister organization of ACORN, said her supervisor told her the list of campaign contributors came from the Obama campaign. Moncrief said she has a copy of a “development plan” that outlines how Obama contributors who had “maxed out” under federal contribution limits would be targeted to give to Project Vote, and that it was her job to identify such contributors. Is there any thing these Chicago politicians will not do? Don’t expect the LA Times to carry this news either.